So after the wedding, we stayed a few extra days in California to revisit some places we’d been to long ago, and find some new favorites. In one of the those totally serendipitous moments that makes travel fun, we drove through downtown Petaluma past an elegant old building with painted lettering on the windows announcing that it was a Seed Bank. Huh? You mean like real seeds? What is this place? Well, we were on our way to somewhere else, so we didn’t stop. But I looked it up later on the internet and said to the spouse “Damn, we should have stopped.” It turned out to be the west coast headquarters of Baker Creek Heirloom Seeds. They opened in 2009 in the renovated Sonoma County National Bank building, originally built in 1926. So we returned the next day, and it was well worth the detour. 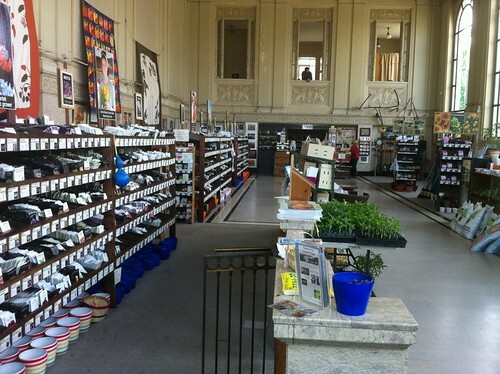 The store sells not just seeds, but books, magazines, tools, gifty-type stuff, etc. A vegetable gardeners’ paradise. I was too overwhelmed to even take pictures, but here are a few that other people have posted on Flickr. I was not too overwhelmed to shop, however. We spent quite a while oohing and aahing and then picked up some pepper seeds, radish seeds, melon seeds, cucumber seeds, flower seeds, magazines, and one bulb of Thai Red garlic. The seeds are awaiting spring, but the garlic is now growing under a row cover in the Tangled Branches kitchen garden. More about edible alliums and row covers in the next post. oh! You got to go to the seed bank!!! I love the people who own this place. I’ve been getting my seeds from Baker Creek since I’ve started gardening. The owner Jere Gettle’s story is quite amazing, from filling seed orders from his bedroom at age 17, to this major conglomerate, he’s pretty amazing. and the work he does with non GMOs is very commendable. I though the whole idea of a “seed BANK” in that old beautiful space was so clever. It is such a fun place! I knew of Baker Creek, but had never ordered anything from them. They gave me a copy of the catalog and I can see why gardeners are so smitten – gorgeous photography, interesting varieties, good stories. I will definitely be a customer from now on. California certainly has a very rich horticultural tradition. Absolutely. I highly recommend a visit! What a nice open air environment. That would be a great room to practice some HDR photography in with those huge windows and light colors. It is striking to see a horticulture shop in this upscale of a setting. I got seeds from Baker Creek for the first time last year and was floored by their gigantic selection. A friend gave me the catalog. Wow!